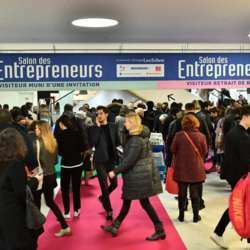 The Salon des Entrepreneurs de Paris is the most important event for creation, start-ups. It is small business/ IT-digital-tech business oriented (67.000 people attend in two days). More than Protected content among politics, officials, well known top managers, journalists will be present. At 14h00 and again at 16h00. Here we meet and introduce ourselves quickly. This is the moment to tell us what you are currently doing or what you intend to create or develop. Maybe you want to start up your entrepreneurial dream and you need information ? Bank/Insurance, Institutions, Franchising, Small Business Tech, Start-Up Factory. If you want to develop your network, get experience and advice, realize your own projects you can discuss with experts. You can register for free, but you have to do it online previously (otherwise 50€).